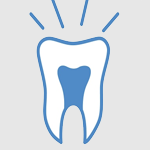 Root canal therapy (endodontic therapy) is a technique used to save a diseased or damaged tooth. The alternative to a root canal would be an extraction or removal of the tooth. Treatment requires that the nerve inside the tooth be removed and replaced with a solid filling material that is resistant to infection. A dark-colored tooth in an adult usually indicates that the nerve of the tooth has become infected and the normal flow of blood in and out of the tooth has stopped.